Some distance from maturity but remarkably slightly more closed than the 2003; perhaps it has shut down and the 2003 will shortly do so? Still incredibly pure and focused with oyster shell and gravel characters alongside the prominent cassis and ripe blackcurrant flavours, it manages to be both weighty and intense and yet boasts near-perfect balance. Served blind at the chateau. There is so much brooding intensity in this wine, almost as if it is stalking the senses. Certainly there is remarkable mineralite here, sensational definition with briary and graphite developing with time. The palate is firm and masculine, tannic, powerful, such density and weight on the finish, yet showing no compassion to the tasted…yet. Approached blind, this is difficult to love as it is such uncompromising Latour, but it will blossom. Tasted December 2009. 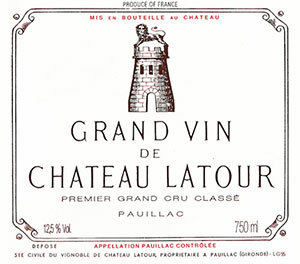 Latour has made truly great wines in the past two decades—and this is one of the best. It has fabulous aromas of black truffles, currants, raspberry and dried flowers. Mind-blowing on the palate, it’s an emotional and soulful red.